I decided to do some research on the newest Pope of the Roman Catholic Church, Pope Francis, and learn a little about him and his beliefs on creation and evolution. I don’t have much experience with the Catholic Church, but I know the Pope is a very important and influential figure around the world. As such, many people accept his teachings and the positions he takes on current events and controversial issues. Pope Francis was born Jorge Mario Bergoglio on December 17, 1936 in Argentina, and is one of five children born to an Italian immigrant railway worker. 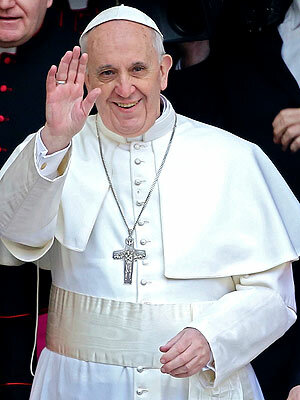 He was the Argentine Archbishop (of Buenos Aires) until elected on March 13, 2013, becoming the 266th Pope. Some have called him a media shy moderate who’s deeply concerned about social inequities, and others have called him a compassionate conservative. Of course I find such a statement disheartening (if not absurd) because we need people in the church standing up for God’s Word over man’s word, and we need leaders who have a good understanding of what science is and isn’t. By insisting that the two positions can peacefully coexist totally ignores the obvious contradictions between the two worldviews, ignores the theological problems that exist, and forces people of faith to reinterpret Scripture in light of what the secular world demands we must believe in order to find that happy medium that only exists in the minds of those in the middle, the politically correct, and anyone who has trouble coping with conflict. But when the Pope says that there’s “much scientific proof in favor of evolution”, this tells me that he doesn’t understand what evolution is. Much of the “proof” presented is a bait-and-switch tactic designed to obfuscate the two so that if you believe the one, you also must believe the other. For example, many evolutionists will refer to the bacteria E. coli as “evolution in action”. They observe changes in E. coli over a certain period of time. Therefore, since we can see E. coli changing before our eyes, this “proves” evolution. However, while such change, speciation or natural selection is expected and understood by creationists, these changes don’t “prove” that E. coli could ever become anything other than E. coli. There’s no evidence that these changes could change E. coli into a fish, amphibian, or mammal. Although Pope Benedict didn’t specify what proof convinced him of evolution, it’s still clear that he doesn’t understand how that evidence is interpreted, and how our worldview shapes that interpretation. Further, blending evolution with Christianity doesn’t enrich our understanding of life- it confuses it. The Bible, for example, tells us that God “formed Adam from the dust of the ground and breathed into his nostrils the breath of life, and the man became a living being” (Genesis 2:7). If evolution takes precedence over God’s Word, then Adam had parents and other ancestors and wasn’t formed by God from the dust on the ground. We must then either reject or reinterpret Scripture so that it conforms to evolution (hardly enriching). But if we believe God’s Word to be accurate and truthful, then we believe that neither man nor animals have evolved over time… instead they all reproduce according to their various kinds (Genesis 1:20-31). Thus there’s a contradiction or confusion that arises when one tries to harmonize the two views and accept a certain amount of each, and you’re left trying to determine which worldview gets the benefit of the doubt. Well, I’m glad he finds room for God in his worldview and gives Him some credit. Pope Benedict’s deference to evolution, however, is understandable only because of the grip evolution has on our culture, education and political system. It’s easy to be swayed by the propaganda that is repeated over and over throughout childhood, high school and college, and in the popular media on a regular basis, especially when the church is often all too willing to accommodate, compromise, and allow secular thinking to seep in. Not only that, but people naturally wish to avoid persecution (even if it’s just verbal), and if it’s necessary to accommodate a different view in order to protect oneself from various forms of persecution, many will all to easily do so. Since the Earth doesn’t have a voice, it’s odd that he would give it a voice, as if giving credence to pantheism and other forms of Earth worship. I would have expected him to be an apologist for God and Scripture, upholding God’s Word rather than diverging from that message for a different gospel message. As for Pope Francis, I haven’t been able to figure out his actual position on evolution thus for, so I will be eagerly waiting to hear what he has to say about it when the time comes. I certainly hope he comes out on the side of creation, but I suspect that won’t be the case. I would say that Pope Francis accepts the concept of theistic evolution; however, he accept the historicity of Adam and Eve as our first parents. God created everything through evolutionary creation and the universe is very ancient. Thanks for sharing. I suspect you’re right about Pope Francis. I’m fairly sure he would accept theistic evolution, despite the theological implications and contradictions it would cause.